Bring your Oahu day to a close with a 90-minute run, which is led by a local fitness enthusiast who also incorporates yoga. Meet your guide in Waikiki for the scenic, 4-mile jog, and enjoy the views of white sand beaches, yachts, and surfers offshore. The session ends with some vinyasa flow to stretch and lengthen your muscles—all while watching the Waikiki lights begin to twinkle at sunset. 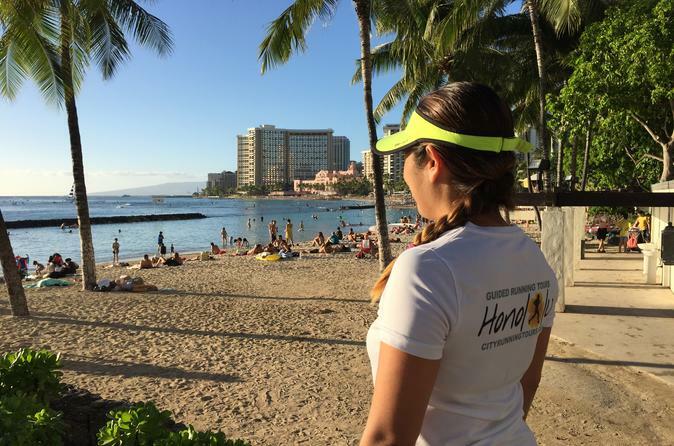 You'll meet your guide at 5:30pm in the center of Waikiki, and do some stretching to prepare yourself for the 4-mile jog down the shoreline. This route features beautiful Waikiki Beach and the Hilton Village Lagoon, as well views of Waikiki Yacht Club and the beach at Magic Island. As you work up a sweat on the Waikiki shore, your guide can share some local knowledge and point out the numerous sights, and offer insight on how to spend the rest of your time on the island. At the end of the run you'll cool down your muscles with some mellow, vinyasa flow yoga, which is specifically designed with runners in mind as you watch the last rays of sun.